Need to get the most out of the world's simplest accounting software? Easy. Xero has revolutionised the world of accounting software. Completely cloud-based, it lets small business owners monitor their finances in real time and promises to reduce the need for endless back-ups, data entry and software upgrades. Xero For Dummies gives readers a user-friendly, in-depth understanding of how the software works and shows them how to use it efficiently, effectively, and strategically. This plain-English guide leads readers through the basics of setting up an accounting system to detailed operations, letting users maximise revenue, profits, and cash flow. Xero For Dummies offers in-depth guidance on such topics as switching over from another accounting software, setting up customers and suppliers, dealing with multi-currency transactions, using Xero's dashboards and robust reporting capabilities, and more. When it comes to balancing the books, small business owners and entrepreneurs need all the help they can get. 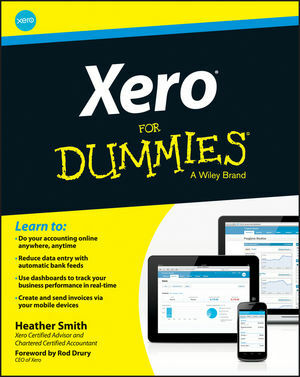 Xero For Dummies is the quick and easy way to master the world's simplest accounting software.